I want to keep it brief so there won't be giant wall of text. You don't really need more info there, unless you don't understand what it says, then you have to do more reaserch, read docs, check the names what they mean, you can also read this thread lot of small things people were confused with ws explained. Is there a way to add more sockets to item which already has sockets? 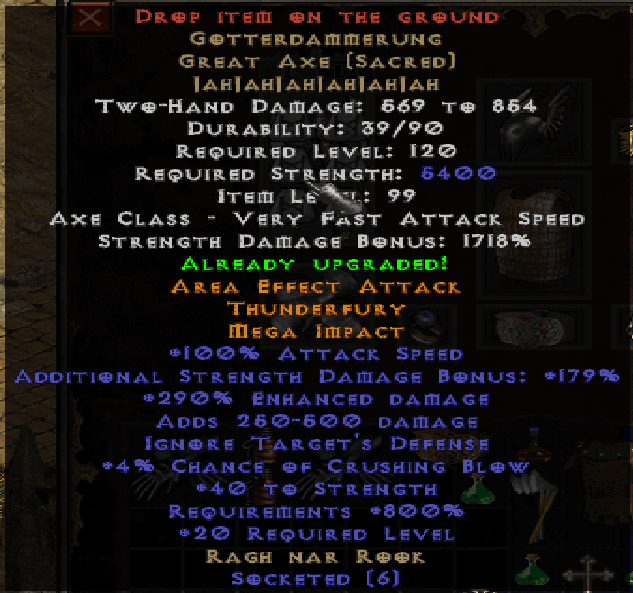 I have trouble finding 6 socket or zero socket sacred ancient armor. Just use Oil of Renewal until it has empty sockets. You should be able to do it if you just do what I did. I'm using same gear as in other ubers there except mal belt for blast wave. Switch to colosseum and switch back to axe. It was just TU items with crafted labrys. Would like to see someone in Yaggais dmg. Sfp4 wrote: Would like to see someone in Yaggais dmg. You need more information, such as what stance, how much ewd from skills (1st d2stats page), to have reliable comparison. It is good for sure, damage and innate procs are nice.